As gold was rocketing higher last year, I was unimpressed because I thought that it was not the sort of thing that could be sustained. Although I was wrong in predicting weakness for gold and gold stocks. Equally wrong were the predictions of emboldened gold bugs. After hitting the magical four digit milestone in March, gold fell on hard times. If you’re like me, then you see the precious metal as just another trading vehicle, without the need to get into philosophical debates about its role in the world or economy. 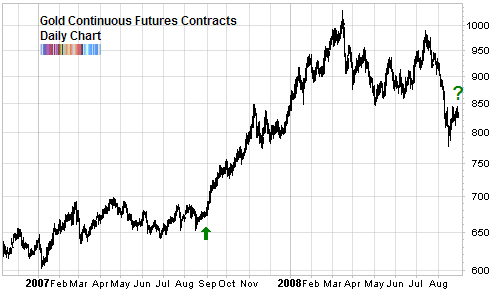 As you can see, for most of the year gold goes sideways, flopping around and making everybody dizzy. Then towards the end of August and the beginning of September, it rockets up almost vertically only pausing a bit to finally close the year strong. But remember, while this is a rhythm observed over time and smoothed out in an average, it does not mean that every year has to follow the same script. That beautiful chart showing long term seasonality hides a lot of cross-currents as well. Commodity bubble bursting? Babak I have been watching the overall commodity bull run from afar for quite some time. I can’t figure out why Oil, Gold, Corn, Soybeans etc all had the exact same huge run from the beginning of Sept 07 until June 08. Certainly people don’t buy all of these commodities with the same strategy in mind. You might buy Gold because you think the world is going to Hell in a hand basket but you don’t buy Corn for that reason. So why do all of their charts look the same? Each of these charts appear to have somewhat of a parabolic blow off (bubble) top around June of this year, especially if you look at a 5 year chart. I noticed that while most of these commodities had their big run, the stock market was going lower. So perhaps the money was just taken out of stocks and put into commodities since it was the hot momentum trade of the moment and that worked for quite a while. But in my opinion it is quite clear that the bubble has burst on all of these charts and these commodities have no where to go but down for the next year or so, other then short bursts higher. I realize that many gold bugs would argue that Gold isn’t a commodity at all, but if it looks like a duck and acts like a duck…. If I am right about the near term demise of most commodities, perhaps it bodes well for the overall market, since they may be reversing the trade and taking money out of commodities and putting it back into stocks. This also would help calm the markets biggest fear right now, inflation. Seems a little simplistic but it could be the case. In any case the way I am putting my theory into action is by trading around a position in DUG. The hurricane has made me lighten up but I want to get a full position back on by early next week. Jim Rogers continuously talks about the see-saw relationship between commodities or “real goods” and the stock market, or paper goods. According to him, there is a long term cycle where they take turns in performance. When commodities are in a bull market, the stock market is in a bear market. And vice versa. You can think of it using a simple analogy, when Kellogg’s has to pay more for corn, they have less for profits (you can only squeeze customers so much). And so, the price of Kellogg’s stock goes down. If you look back into market history through this lens, it is not difficult to find corroborating examples. 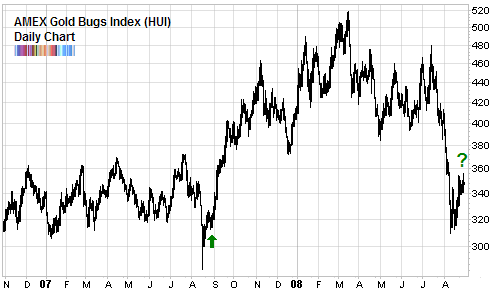 Take the 70’s when commodities where going through the roof while stock suffered. And then the 80’s when the opposite was true. We have been clearly going through a phase in the market when the price of “real stuff” is going through the roof, causing a lot of joy for the producers and a lot of grief for those who have to buy them. When will the cycle end and when will we see equities take the lead once again? It is difficult to judge because usually the cycle takes 20-25 years to play through. But there are signs that we are seeing a blow off. Take for example the exuberance in Brazil. Or as you point out the parabolic charts for almost any commodity.